Piscataway, N.J — Sam Kerr’s bicycle kick pleased the home crowd of 3,065, but ultimately Sky Blue FC fell to the Orlando Pride 3-2 at Yurcak Field in Piscataway, N.J. Sky Blue conceded two goals in the game’s final 13 minutes to Pride forwards Marta and Rachel Hill, after going up 2-1 on Kerr’s bike. Kerr’s brilliant goal came right after halftime, before some fans had even settled back into their seats. Forward Maya Hayes dribbled down the left wing and into the box. Hayes’ initial cross was blocked by Orlando, but bounced back to her near the end line. She then looped it back behind her to Kerr, who had her back to goal on the left side of the six yard box. The 23-year-old Australian then unleashed the bicycle kick, hitting it over her head with her right foot past Pride goalkeeper Aubrey Bledsoe to break a 1-1 deadlock. Marta equalized in the the 77th minute on a play she started about 30 yards from goal. The Brazilian took a long ball from Ali Krieger and dribbled left before passing it to Hill, who had entered the game only 10 minutes earlier. The rookie then tapped it to Steph Catley a few steps ahead of her. Catley sent a low cross into the box, and Sky Blue FC defender Mandy Freeman’s misclear bounced right to Marta, open at the penalty spot. 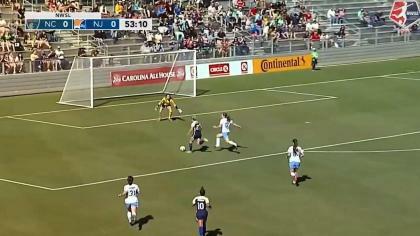 The Brazilian cooly one-timed a left-footed shot through three defenders and past Sky Blue FC goalkeeper Kailen Sheridan for her league-leading sixth goal of the season. “I wish I knew the answer to that. It’s probably why she’s such a great player,” Pride coach Tom Sermanni said when asked how Marta still finds herself open in dangerous spots after such a long career. Hill put Orlando ahead in the 86th minute, heading a cross from Catley past Sheridan to make it 3-2 in favor of the visitors. Once again, it was Marta who started the play with a backheel flick to the overlapping Catley, who then passed it to Hill. The rookie forward scored the game-winner, and her first career goal, in front of a large cheering section as her family had driven up to Yurcak Field from Pennsylvania. “I think I might’ve closed my eyes but ended up in the back of the net,” Hill said of her goal. As for scoring in front of friends and family? “I couldn’t have pictured it any better,” she said. Hill, a rookie out of UConn joined the Pride at the end of May. She started her first three games for Orlando before coming in as a second half sub Wednesday night. Even before the late game dramatics, the first half of the match had quite a bit of drama of its own. The Pride took a 1-0 lead in the 11th minute on a goal from Chioma Ubogagu before conceding two penalty kicks before halftime. The first one, taken by Sarah Killion in the 20th minute, was saved by Bledsoe. A foul by Ali Krieger on Daphne Corboz drew the spot kick. It was Killion’s third straight penalty kick miss after scoring four straight to start the season. Sky Blue’s second penalty attempt came in the 45th minute and was converted by Kelley O’Hara after Catley fouled Kerr. O’Hara’s goal tied the game 1-1 at halftime. When these two teams last met — at Yurcak Field on May 27 — it was Sky Blue who stole three points with a late game-winner. Wednesday, it was Orlando’s turn. Sky Blue FC (5-6-1, 12 points) next faces the first-place Courage in North Carolina on Saturday (NWSL Game of the Week on Lifetime, 3:30 p.m. ET). The Pride (4-4-3, 11 points) head home to host the Red Stars on Saturday. Match ends, Sky Blue 2, Orlando Pride 3. Second Half ends, Sky Blue 2, Orlando Pride 3. Foul by Rachel Hill (Orlando Pride). Attempt missed. Sarah Killion (Sky Blue) right footed shot from the right side of the box is too high. Nikki Stanton (Sky Blue) is shown the yellow card for a bad foul. Marta (Orlando Pride) wins a free kick on the left wing. Mônica (Orlando Pride) wins a free kick in the defensive half. Foul by Kayla Mills (Sky Blue). Goal! Sky Blue 2, Orlando Pride 3. Rachel Hill (Orlando Pride) header from very close range to the bottom right corner. Assisted by Stephanie Catley with a cross. Substitution, Sky Blue. Nikki Stanton replaces Samantha Kerr. Attempt saved. McKenzie Meehan (Sky Blue) left footed shot from outside the box is saved in the top centre of the goal. Assisted by Kelley O'Hara. Corner, Orlando Pride. Conceded by Christie Pearce. Substitution, Orlando Pride. Mônica replaces Dani Weatherholt. Offside, Sky Blue. Daphne Corboz tries a through ball, but McKenzie Meehan is caught offside. Substitution, Sky Blue. McKenzie Meehan replaces Taylor Lytle. Foul by Daphne Corboz (Sky Blue). Goal! Sky Blue 2, Orlando Pride 2. Marta (Orlando Pride) left footed shot from the centre of the box to the bottom left corner. Attempt missed. Rachel Hill (Orlando Pride) right footed shot from outside the box is high and wide to the right. Assisted by Stephanie Catley. Attempt blocked. Samantha Kerr (Sky Blue) right footed shot from outside the box is blocked. Assisted by Taylor Lytle. Jasmyne Spencer (Orlando Pride) is shown the yellow card for a bad foul. Foul by Jasmyne Spencer (Orlando Pride). Daphne Corboz (Sky Blue) wins a free kick in the defensive half. Corner, Orlando Pride. Conceded by Raquel Rodríguez. Stephanie Catley (Orlando Pride) wins a free kick on the left wing. Foul by Kelley O'Hara (Sky Blue). Marta (Orlando Pride) wins a free kick in the attacking half. Hand ball by Raquel Rodríguez (Sky Blue). Substitution, Sky Blue. Leah Galton replaces Maya Hayes. Corner, Orlando Pride. Conceded by Mandy Freeman. Substitution, Orlando Pride. Rachel Hill replaces Jamia Fields. Kristen Edmonds (Orlando Pride) wins a free kick on the right wing. Substitution, Orlando Pride. Jasmyne Spencer replaces Chioma Ubogagu. Attempt missed. Kelley O'Hara (Sky Blue) right footed shot from outside the box is too high from a direct free kick. Attempt blocked. Marta (Orlando Pride) left footed shot from the left side of the box is blocked. Assisted by Jamia Fields. Attempt missed. Maya Hayes (Sky Blue) right footed shot from the right side of the box is close, but misses to the right. Assisted by Samantha Kerr. Delay in match Jamia Fields (Orlando Pride) because of an injury. Attempt missed. Camila (Orlando Pride) right footed shot from outside the box misses to the right. Assisted by Stephanie Catley. Goal! Sky Blue 2, Orlando Pride 1. Samantha Kerr (Sky Blue) right footed shot from the left side of the six yard box to the top right corner. Assisted by Maya Hayes. Attempt blocked. Alanna Kennedy (Orlando Pride) left footed shot from outside the box is blocked. Assisted by Dani Weatherholt. Second Half begins Sky Blue 1, Orlando Pride 1. First Half ends, Sky Blue 1, Orlando Pride 1. Goal! Sky Blue 1, Orlando Pride 1. 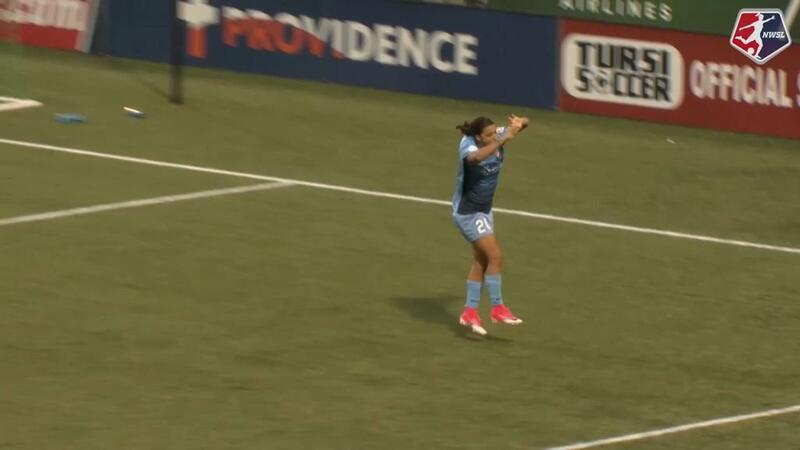 Kelley O'Hara (Sky Blue) converts the penalty with a right footed shot to the top left corner. Penalty conceded by Stephanie Catley (Orlando Pride) after a foul in the penalty area. Attempt saved. Samantha Kerr (Sky Blue) right footed shot from the centre of the box is saved in the centre of the goal. Attempt blocked. Jamia Fields (Orlando Pride) left footed shot from the right side of the box is blocked. Corner, Orlando Pride. Conceded by Kelley O'Hara. Attempt saved. Samantha Kerr (Sky Blue) right footed shot from a difficult angle on the right is saved in the centre of the goal. Attempt saved. Samantha Kerr (Sky Blue) right footed shot from outside the box is saved in the top centre of the goal. Attempt blocked. Marta (Orlando Pride) left footed shot from the right side of the box is blocked. Hand ball by Jamia Fields (Orlando Pride). Attempt blocked. Alanna Kennedy (Orlando Pride) right footed shot from outside the box is blocked. Assisted by Marta. Attempt saved. Marta (Orlando Pride) left footed shot from the left side of the box is saved in the centre of the goal. Assisted by Chioma Ubogagu. Penalty saved! Sarah Killion (Sky Blue) fails to capitalise on this great opportunity, right footed shot saved in the bottom right corner. Penalty conceded by Ali Krieger (Orlando Pride) after a foul in the penalty area. Penalty Sky Blue. Daphne Corboz draws a foul in the penalty area. Offside, Orlando Pride. Stephanie Catley tries a through ball, but Chioma Ubogagu is caught offside. Goal! Sky Blue 0, Orlando Pride 1. Chioma Ubogagu (Orlando Pride) left footed shot from the right side of the box to the bottom left corner. Attempt missed. Jamia Fields (Orlando Pride) left footed shot from the centre of the box is too high. Attempt saved. Chioma Ubogagu (Orlando Pride) left footed shot from the centre of the box is saved in the centre of the goal. Assisted by Jamia Fields. 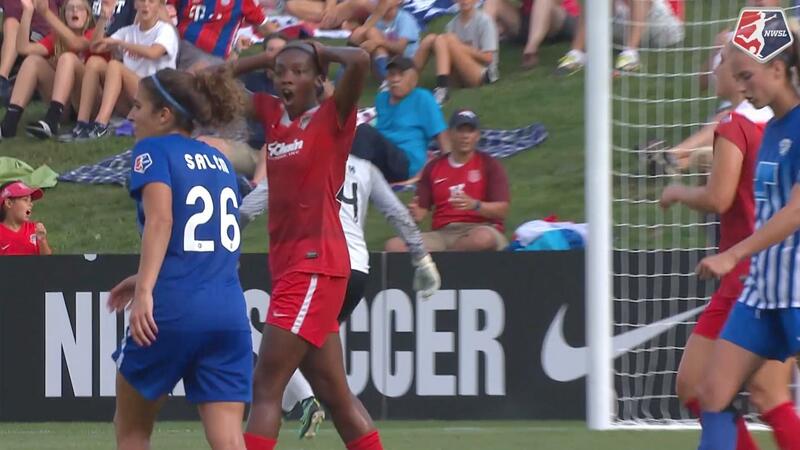 Foul by Chioma Ubogagu (Orlando Pride). Samantha Kerr (Sky Blue) wins a free kick in the defensive half.